Originally posted in the Brandon Sun, November 18, 2016. I can already hear some of your voices in my head as you’re reading this - “Oh Cody, yet another IPA? Are you serious? I hate IPAs.. why aren’t you reviewing Stella Artois instead? All you ever do is review IPAs!” Well, India Pale Ales are a very broad style of beers to the point that it can taste like a lager (Alexander Keith’s) or like a wheat beer (Belgian IPAs). A common theme from a few of my friends who became IPA lovers in Manitoba were that they visited BC, checked out Victoria, BC's Driftwood Brewery and fell in love with their Fat Tug IPA. Fat Tug is easily one of my top five IPAs in the world, and that includes Heady Topper out of Vermont. Driftwood Brewing makes more beers than just Fat Tug, in fact - they make a lot of amazing beers and their beer labels are some of the best in the entire industry thanks to the folks over at Hired Guns Creative out of Nanaimo. 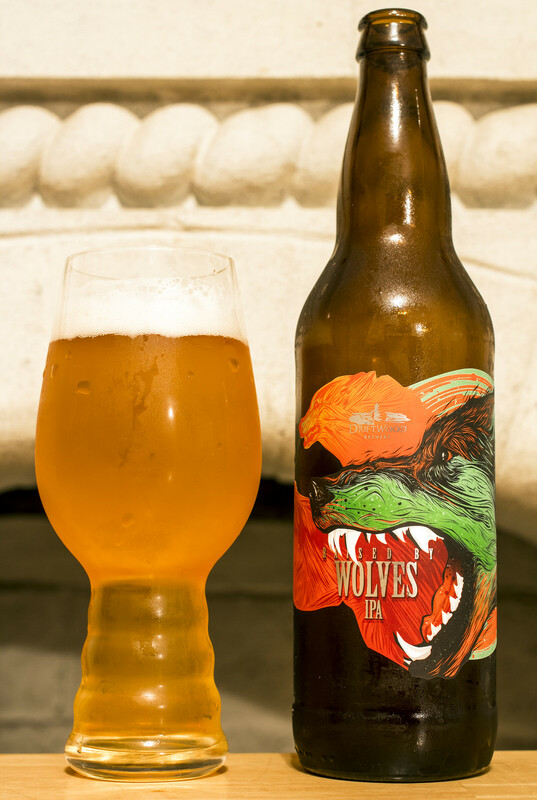 This week, I’m checking out Driftwood’s Raised By Wolves IPA. Raised by Wolves is described as being born of equinox hops and raised under the influence of saccharomyces trois yeast, this beast has developed a taste for mango, citrus and melon with a nose to match. I’m not familiar with equinox hops and haven’t had any beers with saccharomyces trois yeast in the past so the “Raised by Wolves” wild theme actually plays well into the theme of the beer. The beer pours a pale cloudy golden straw ale with a great deal of micro-carbonation, a hint of fizz and a good deal of off-white foaminess that is reminiscent to your typical Canadian IPAs - creamy, mild thickness and leaves lots of foam bits on the side of the glassware. The aroma is simply tasty - if you are familiar with beers that use Galaxy hops, then you are in for a treat - this beer is very reminiscent to a Galaxy hopped IPA as it’s a liberally citrus-forward IPA with notes of grapefruit, melon, orange peel, peach and mango. There’s a hint of pine bitterness as well but in this case, there’s more fruit in the hops than bitterness - almost like a fruit cocktail. My initial impression on the taste is that the hop bitterness is very much present, with a bitter pine flavour to it, the tropical citrus flavours are very much dominant in this Vancouver Island IPA. The flavours I get are pineapple, mango, bitterness of grapefruit and a hint of apricot.